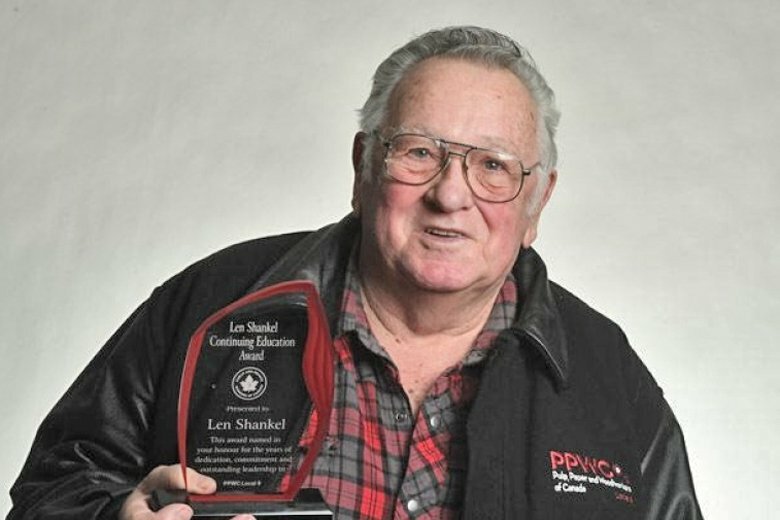 Longtime retired president of Local 9 of the Pulp, Paper and Woodworkers of Canada (PPWC) union, Len Shankel was born in Liverpool, Nova Scotia in 1937. Len and a fellow hunting and fishing friend Jim Smith left their hometowns back east and eventually ended up in Prince Rupert in the ’50s. Len arrived in 1956 and worked as a longshoreman on the docks in Prince Rupert. It was a point in time when the hiring procedure for casual workers went like this: the dispatcher would stand on a table and look down over the crowd of people looking for work and randomly select what he thought would be a good worker and Len got the job loading and unloading ships docked at the port. From there, he worked at the Columbia Cellulose Pulpmill in Prince Rupert and worked as a labourer in the digester area for about two years. 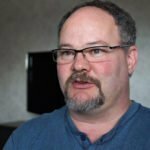 He successfully applied for a job in mechanical maintenance and after a five-year “type” of apprenticeship (they didn’t offer an actual apprenticeship back then) earned his journeyman pipefitters qualification. He moved to Prince George in 1964 and worked for Marwell Construction; the construction company that built the Prince George Pulp (PG Pulp) and Intercontinental Pulp (Intercon) mills. Len applied for a job at PG Pulp in 1966 and was hired by supervisor Wilson Niass. He worked in mechanical maintenance for 34 years and retired from the company in 2000. By the late 1950s, all pulp and paper mills in Canada and the United States were unionized by American unions; pulp was controlled by the International Pulp Sulphite Workers Union and paper was controlled by the United Papermakers International Union and each of these unions were guarded by the AFL-CIO. Time went by and along came Orville Braaten, an executive member of the Western Pulp and Paper Council and known to many as one of the founding father’s of the PPWC. Dedicated to the union movement, he was one of the first to question the direction of the American-controlled International Pulp Sulphite Union, the first to demand alternatives and the first to suggest a strictly Canadian union. The Pulp, Paper and Woodworkers of Canada (PPWC) came into being in January 1963. 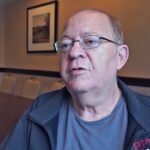 Len remembers the event well because – and to make a long story short – the international union workers in Prince George, Nanaimo and Campbell River were all denied a vote in the matter. In August of 1967, a second application was submitted by Local 9 in Prince George to certify the PPWC; however the Labour Relations Board rejected the application a second time because they basically knew that any vote would usher in the PPWC and push the American union out. This was when the following five executive members of Local 9 were fired for aiding and abetting another union; Len was the president, George Smith the first vice-president, Mickey Finnigan the corresponding secretary, Noel Nobel the trustee and the shop steward was Gerry Richardson. Len explained, “We were all fired for four months while the battle went on in the court system. 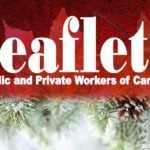 During that time other PPWC union workers all over B.C. donated part of their wages to cover our wages. 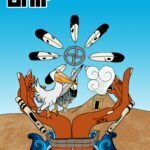 Eventually a certification vote was held and the PPWC won 91 per cent of the vote and still it was contested by the international union; after the vote we were all reinstated with full seniority and vacation time. “Another important and successful battle was when we petitioned to upgrade the wages of the kitchen workers. We asked for the union base rate to be paid to all the female cafeteria workers; it took some time and plenty of negotiating, even with our own members, but we did it. Len is a licensed trapper and has been a member of the Trappers Association for over 15 years. The B.C. 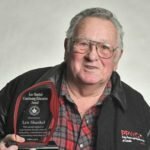 Trappers Association recognized him with the BCTA Recognition of Service award in 2007. He volunteers and is happy to give back to his community. 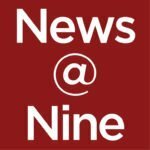 He served on the board of directors at the Elder Citizens Recreation Association for four years and is currently serving on their Kitchen Expansion Committee. 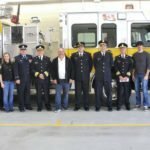 He received the Continuing Education Award, an award in his honour for his many years of dedication, commitment and outstanding leadership to the PPWC, Local 9. When he retired in 2000, he received recognition from the management and all the employees of Canfor Prince George Pulp & Paper Mills in recognition of his outstanding leadership and commitment that contributed to a safe and respectful workplace for all employees. Len’s wife of many years, Delores (Birkeland) sadly passed away in 2009. They had two children Lavona (Cliff) and Jason and one grandson. Premier Dan Miller served as Premier of British Columbia from August 1999 to February 2000 following the sudden resignation of Premier Glen Clark on Aug. 25, 1999. In his younger years, Len earned a position as a pitcher on the all-star baseball team in Prince Rupert. He played in the league for nearly ten years; his experience in baseball came from the teams he played on while living in Nova Scotia. He fought for and was a member of the Prince Rupert Boxing Club. He fought in the 150-pound category and his fights were recorded in the Prince Rupert newspaper called The Daily in 1957. It is no wonder that he had a great baseball pitching arm. Len concluded by saying, “My heart is still in the industry and I still spend time at the PPWC union office. Ending up in Prince George over 50 years ago was a good move. I have some great memories and some sad memories, I had a great career and I like to think that I helped cut a good path for many pulp mill workers along the way.